When the moosh was tiny I spent hours in my glider with her, praying for her to just fall asleep already. There were so many things I wanted to do or could do if she would just. fall. asleep. I had my first good cry over motherhood in that chair. I’ve cured fevers and nightmares in that chair. I have laughed from that chair, played from that chair, screamed from that chair and have probably read over a thousand stories and sang well over a thousand songs in that chair. It was over a year ago that she last fell asleep in my arms in that chair. I have tried to trick her multiple times into falling asleep in my arms in that chair. Just so I can hold her warm little sleeping body, snuzzle my nose into her curls and listen to her breathe. Tonight I finally tricked her. I was ready to spend the entire night rocking in that chair holding onto my baby, sniffing her freshly washed curls. She woke up after five minutes and asked to be put in bed. I’m pretty sure she couldn’t have sank my heart faster with an anchor and lead weight. You put them to bed as babies. And they wake you up (what seems like) the next morning as little kids. She is so precious…eyes that blue just HAVE to be from heaven, don’t you think? She’s such a vibrant gorgeous little one that it’s not all sad. But I have that tug and ache too. That moment when I try to get the little one to snuggle in my lap, and all she wants to do is tell me a story. That moment when I realized that she fell asleep better, more quickly, more deeply, alone in her own bed than in my lap. The flip side, which you obviously know, is that as they get older so many new wonderful modes of connection happen. But, oh, if we could only have a few minutes of infant snuggle from them every once in a while, it would certainly be very lovely. MommyTimes last blog post.."Did you do something different to your hair?" I, too, have a chair….you described it perfectly. OMG, she looks so much like you in that last photo! Aww – loved your description of The Chair. Don’t we all as Mom’s have that same chair? You made me want to go wake my O and hold her while she’s asleep. Moosh is a beauty – those curls! those eyes! I’m sure you hear that ALL the time. Don’t ever get tired of it!!! Andrea in INs last blog post..Ah, What a Let-down! I don’t have kids, but I kind of feel that way about my OWN childhood. How did I go from playing summer league softball and picking tomatoes with my grandad…to married and living in Canada? And overnight? Wednesday I sat in my own chair holding my 6 day old son and I just didn’t want to put him down. It didn’t matter that my other two kids were hungry and my husband would rather starve than cook, I just wanted to spend the rest of eternity right there with my tiny little baby. 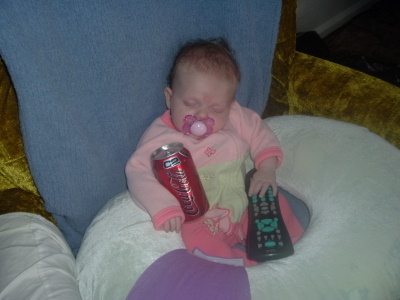 I love the coke can and remote. Who hasn’t fallen asleep like that? I just can’t even handle how absolutely adorable she is, with her floppy moppy curls (I mean floppy moppy in the BEST possible way!). Tell me about it! WAY TOO FAST! And the faster they grow the older I feel, and I really don’t want to feel old! GORGEOUS! She is just absolutely gorgeous! Love her curls! She’s got to be the envy of all the little girls she knows! oh my. adorable. my oldest will be 16 soon. i can’t believe it. and just for the record almost 16 year olds are not adorable. Your Moosh is adorable. 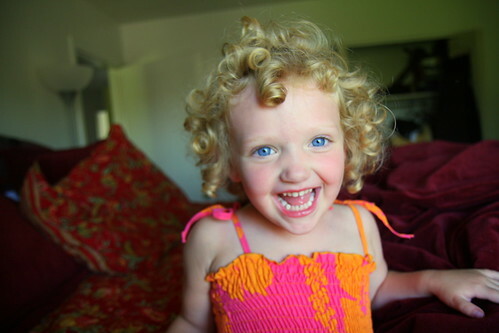 Her curls, those big blue eyes. Her personality shines through the web page. And that baby picture of her is funny. What a cute little baby! Casey- It never to fails amaze me at how beautiful the Moosh is. Especially her eyes. I know what you mean about it going too fast. Mine are 13 and 7 and I love the fact that they still like to snuggle up and sleep with me. Hub was away this week on business and they both wanted to sleep in bed with me at the same time! They had to compromise and ecah take a night…otherwise I can’t sleep! Cherish the warm snuggly love and pray it continues. They come back. My 12 year old crawled into my lap to be rocked the other day. I nearly died of bliss. And keep the chair. You’ll never find another that’s as comfortable. GAH! Tears! Darn you casey. I loved rocking in the glider with my oldest, but the baby is not a cuddler (except when he first wakes up) so I don’t get nearly as much time with him in the glider. There’s a creepy kids’ book called Love You Forever about a mom who rocks her son to bed every night… even sneaks into his house when he’s an adult to do it (I told you it was creepy), but as my oldest nears 4 and is starting to resist the cuddling more and more I can see how you just crave it after it’s gone. But I bet The Moosh gives one heck of a hug when she wants too! Rachaels last blog post..JJ Abrams, you are my hero! I love the photo with the boppy. She is so adorable. My son and I still rock in the glider it is the best. I am cherishing the moments because I know it is not too long before he will be asking to just go to bed. She is adorable (as a baby and a big girl)! What beautiful hair! I just went through that with my 2 year old. I used to spend (what seemed like) forever rocking her to sleep. Now it’s a couple of books and she does it herself. I guess it means we are doing our job but I sure miss those night time snuggles. That’s quite the fabric on that chair in her baby pic huh!?! I still let my little ones, and my big ones, crawl in bed with me sometimes so I can do that thing where I stroke their hair and cheeks and stare at them until they flutter their eyes, realize i’m 2 inches away from their nose and scream in fright…that’s luvvv. I tried that once with Moo and Too. They were all ‘you are creepy mum’ *sigh* might have something to do with the fact that they are taller than me now. Kelleys last blog post..I am totally a pron star. can’t wait until you put my kid to sleep…and you remember how much babies hate to go to sleep. hurry up and get here. I know exactly what you mean! And my son won’t let me rock him in the glider anymore either, at 17 months. So sad. But man, I spent a lot of damn time on that chair for a while there! Well said! I’ve been watching the babyness disappear from my almost-18-month-olds, and wondering where the time went. Yup they grow up way to fast! My two youngest (7 and 11) boys will still snuggle up to their mom but not their dad All I get are feet in my face when they sneak into our bed in the middle of the night. I have that chair. I miss those hours spent reading and singing and rocking. I miss watching her eyes move about underneath her lids. I miss the way she felt in my arms as she snuggled in closer. it all goes so fast! love the pictures! I know exactly what you mean. My rocking chair was broken a few months ago. I’m semi-distraught about it. It does go so unbelievably fast. Moosh is BEAUTIFUL. ack! ack! I just ran into your blog a month or so ago and am still reading your archives. Then I saw this picture this morning. In my poor little brain, she grew up in a month! oh my! She is a cutie. Did the Moosh’s dad contribute any genetic material to her creation? Because she is all gorgeous you! Ahhhhhhh tears! I was thinking that exact same thing tonight with my 20 month old. So sad.